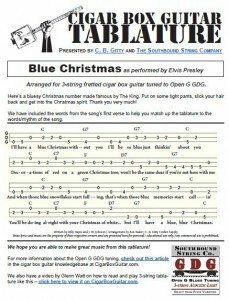 Learn how to play “Blue Christmas” as performed by Elvis Presley on your 3-string Open GDG Cigar Box Guitar. 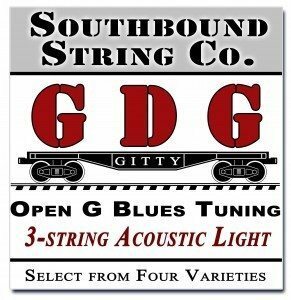 The tablature in the PDF link below shows you the notes and chords you need to play the bluesy Christmas song Blue Christmas on your 3-string cigar box guitar or other homemade instrument tuned to open G GDG. Perhaps the most famous artist to record this song was none other than the King himself, Mr. Elvis Presley, but a whole cast of other singers and bands have done so as well. They include Johnny Cash, Collective Soul, REO Speedwagon, Kelly Clarkson, Bruce Springsteen and Michael Buble, just to name a few.